Cable Detections EZiCAT xf-Series locators provide operators with additional 512Hz and 640Hz tracing modes, enabling operators to trace buried utilities over greater distances or to easily detect sewer – camera inspection systems. Additional features include Mode Lock – the locator starts in the last mode of operation and Current Measurement, used to trace and identify services when using the EZiTEX signal transmitter. 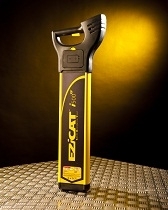 The EZiCAT xf-Series locators are designed with an emphasis on long distance tracing and the detection of sewer - camera inspection systems. Two additional tracing frequencies, 512Hz and 640Hz, have been added to the xf-Series locators and signal transmitters, delivering a greater tracing range for ground surveyors and utility contractors. GIS mapping via Bluetooth connectivity allows operators to seamlessly capture information about the utility they are surveying. The geographical position and utility depth can be captured; additional site notes and photographs can also be included, maximizing the survey process. Mode Lock – All xf locators start in the last mode of operation at maximum sensitivity to simplify the tracing process. Mode Lock is an operator defined setting. Current Measurement - Displays the amount of current flowing through a service helping to trace and verify the utility the Leica Digitex is connected too. This enables improved tracing and identification of an individual service in congested site situations. 8kHz / 33kHz / 512Hz and 640Hz Tracing Modes – Easily locates low frequency camera Sondes and services over a greater distances. Rechargeable Battery Option- Offers the users an environmentally friendly, low cost, high performance alternative to secondary batteries such as alkaline. Automatic controls – making the Digicat easy-to-use, requiring minimal user experience. #· Hazard Zone – Buried utilities close to the surface pose a safety risk to site works. The Hazard Zone function provides an additional warning of the close proximity of buried services, alerting users to the immediate danger. Pinpoint assist - Maintains the highest peak reading obtained on the signal strength indicator. The peak hold time can be adjusted between 0-5 seconds allowing the operator to quickly and accurately pinpoint the service position. Signal Strength Indicator - SSI enables the user to trace an individual service amongst a multiple of services. The numeric display shows the highest reading over the service, which has the Leica Digitex connected too. This ensures the user can follow the service without straying onto another. The SSI mode can also be used to trace the Dual Frequency Sonde with ease. Built-in test function- For testing hardware and software. LCD screen with built-in light sensor- Automatically enabling the backlight in dark conditions. Robust, lightweight design- Specifically engineered for tough site conditions. Service Due Indicator - supporting planned maintenance schedules or quality systems by displaying a wrench icon after 12 months.